De Hoop is a Marine Protected Area and world-renowned as one of the best whale-watching spots in the Western Cape. The whale trail is a 54km route from Potberg to Koppie Alleen and it includes five overnight stops. 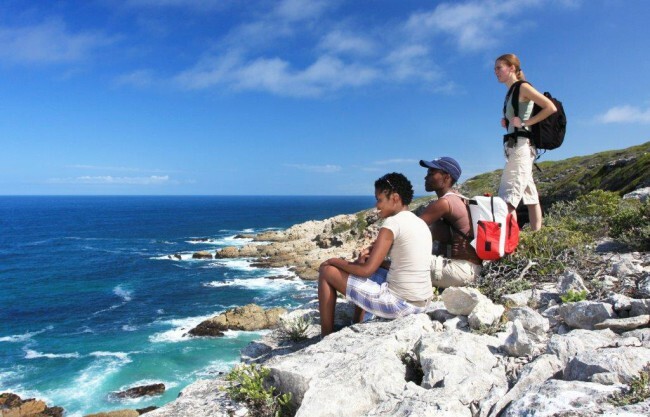 Hikers can savour the fragrance of fynbos on the Potberg Mountains and the unique fynbos plains intermingled with a salty sea air – such is the diversity of De Hoop Nature Reserve. The trail is designed to attract nature lovers with a moderate degree of fitness. The trail is booked up to a year in advance and bookings are limited to groups of six or 12 people. Unfortunately, children under eight are not allowed. The trail is uni-directional and takes five days to complete, you can leave your vehicle at Potberg and a shuttle service will return you to Potberg. This trail is clearly marked with footprints embedded in clay tablets. Each day’s hike varies in intensity with walks between 7,8km and 15km, and the walks allow time out to explore marine life in the many rock pools along the coast. While hiking and marvelling at the abundance of indigenous plants, and yes of course Whales! Relax on the dunes and watch in awe as these beautiful creatures gather in large numbers a mere kilometre from the shore line. An optional porterage service is available, which allows you the luxury of carrying only your backpack and a camera to capture your memorial experience.